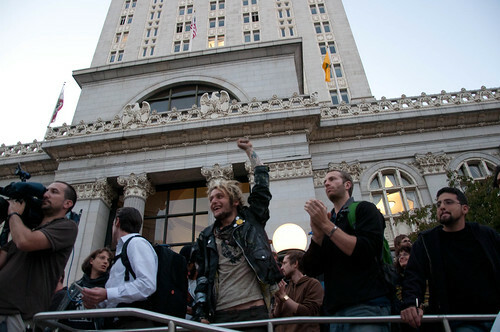 A protester at Occupy Oakland raises his fist as people gather in front of city hall for a general assembly Oct. 26, 2011. Photo by Nelson Estrada. A peaceful gathering at Frank H. Ogawa Plaza grew tense when protestors participating in the Occupy Oakland demonstration were denied entrance to the 12th St. City Center BART station, resulting in two arrests. 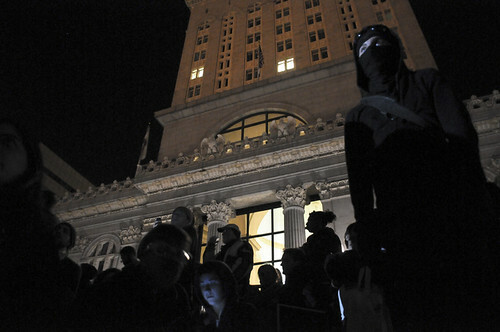 The Occupy Oakland protesters were urged by members of neighboring OccupySF to join the group at Justin Herman Plaza in anticipation of a police raid on the encampment a day after violent confrontations between police and protesters in downtown Oakland. BART officials and police shut down the 12th Street Oakland BART station as protesters approached with the intention of joining the demonstration at Justin Herman Plaza, which already had an estimated 500 people gathered. 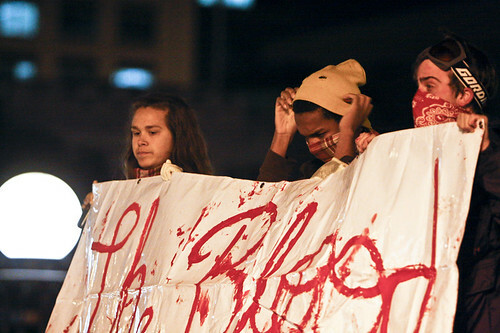 In lieu of BART closures, the protestors began to march down to Oakland City Hall. 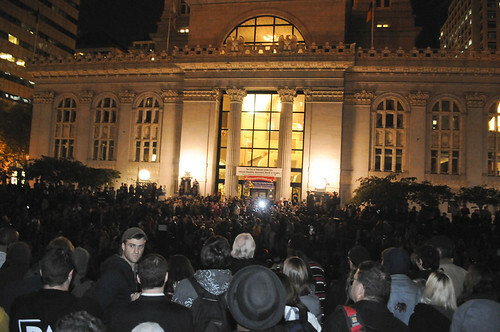 The estimated 1,000 people in attendance to support Occupy Oakland began to lose momentum after they were prevented from traveling to San Francisco. However, San Francisco resident Danny Colligan, 26, who did make it from Oakland to San Francisco to support the occupation, shared his thoughts on the night. The support continued well into the night with dancing, drumming, and sit-ins remaining strong into the late hours of 3 a.m. The crowd gathers around as to begin activism at 14th and Broadway at Occupy Oakland Oct.26, 2011. Photo by Nelson Estrada. 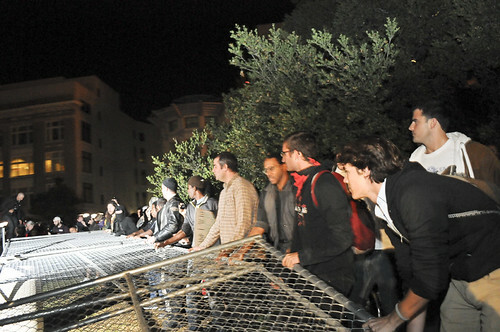 Occupy Oakland protesters help remove fences in front of Oakland City Hall at Justine Herman Plaza Oct. 26, 2011. Photo by Nelson Estrada. 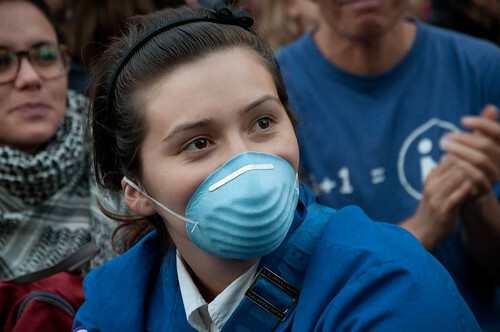 Daniella Martinez, a protester with Occupy Oakland, wears a mask in preparation for a repeat of last night's tear gas deployment by police, Oct.26, 2011. Photo by Nelson Estrada. 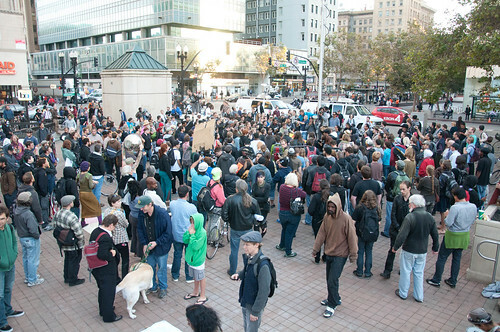 As many as 1,000 supporters of Occupy Oakland gather for a general assembly at Frank H. Ogawa Plaza in Oakland, Calif. Oct. 26, 2011. Photo by Erik Verduzco. 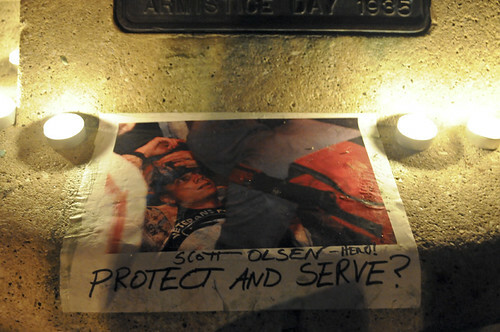 People set up candles around a photo of Scott Olsen, an Iraq War veteran, a day after he was hit in the head by a police projectile during a demonstration by Occupy Oakland at 14th and Broadway Streets in Oakland, Calif. Oct. 25, 2011. 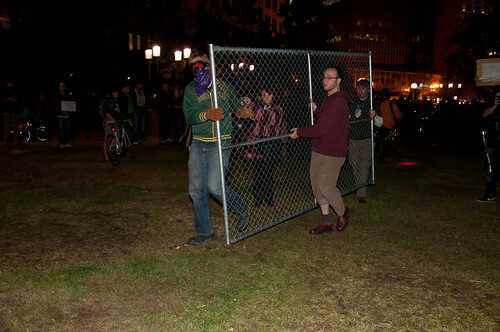 Protesters with Occupy Oakland take down fences around Frank H. Ogawa Plaza during a general assembly in Oakland, Calif. Oct. 26, 2011. Photo by Erik Verduzco. Protesters with Occupy Oakland carry a banner during a general assembly at Frank H. Ogawa Plaza in Oakland, Calif. Oct. 26, 2011. Photo by Erik Verduzco.